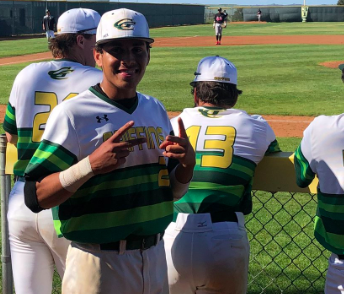 Grossmont's Stevie Montejano hit a grand slam on Friday. EL CAJON – The Grossmont College Griffins rolled up 41 runs in a series sweep of Imperial Valley College last week before dropping a non-conference contest to Long Beach City College on Saturday. The Griffins won the opener against the Arabs, 16-1, on Tuesday, as five pitchers combined on a three-hitter, led by starter Ian Thompson, who struck out five over six innings. Noah Quintana, Cooper Copeland and Trevor Back all threw one scoreless inning for Grossmont. Former Santana Sultan T.C. Simmons had four hits and drove in four for the Griffins. Alexei Andranovich, a freshman from Poway, homered for Grossmont. The Griffs followed that up with a 10-6 win over IVC as former Granite Hills star Josh Verdon drove in three runs for Grossmont. The Arabs led 6-0 early. Copeland threw four innings of scoreless relief in that one. 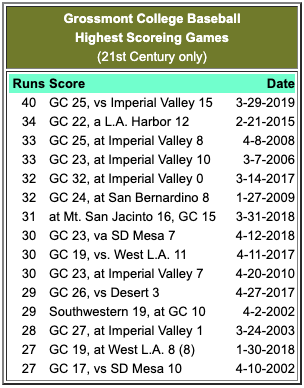 Grossmont completed the series and doubleheader sweep with a 25-15 outburst led by former El Capitan High star Stevie Montejano, who hammered a grand slam. Long Beach won Saturday’s contest here, 8-2.